?Scientific observation then has established that education is not what the teacher gives; education is a natural process spontaneously carried out by the human individual, and is acquired not by listening to words but by experiences upon the environment.? 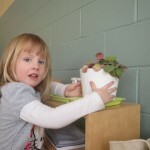 When you enter any authentic Montessori learning environment, one of the first things you should notice is the plants. 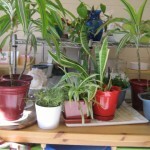 Real live plants, in beautiful pots, arrayed carefully around the classroom, all within reach of the children. There might also be an animal. Some kind of small creature who lives in the classroom. For some it is fish, for others a mammal or an amphibian. This animal is named, and it is cared for by the children. 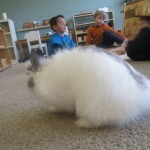 This year in our classroom, Merlin the bunny rabbit has freedom to roam about the classroom throughout the morning, he is fluffy and white, and the children delight when he hops up to their work mat, as if to observe them while they count the beads, build the tower, or write a story. 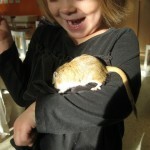 These direct daily encounters with nature offer invaluable opportunities for real learning. There is a lesson of accountability that comes with watering the seedlings regularly so they continue to grow, and the responsibility of changing the rabbit’s litter or it will smell. Words the children will? encounter later in their study of zoology and botany are made real as they clean leaves and discover the midrib or stipule, or examine and name the various fins on their pet fish. 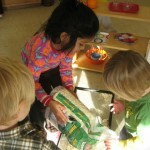 It is true that these elements are not per se exclusive to a Montessori environment; many traditional classrooms also have a pet, and may have a plant or two. 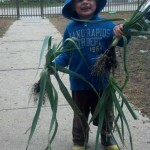 What is very different is the extent to which the child is responsible for the life of that pet, and those plants. Ours is truly a ?Children’s House? 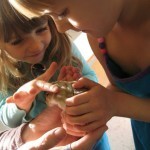 -everything belongs to them, and with guidance and support, they tend to all the living things in their classroom. 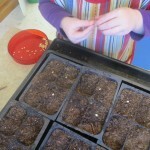 Watching a three-year-old water plants, or a team of kindergarteners change bedding and then prepare vegetables for their pet, we see the strength of their sense of ownership and responsibility.? The children build on their natural tendency toward compassion, caring and tenderness, by performing all the tasks necessary in the life-cycle of these plants and animals, and experience grief and loss when something they care for, dies.